The 8 x 6 Waltons Honeypot Bramble Wooden Playhouse is one of the larger and more impressive looking playhouses from Waltons. 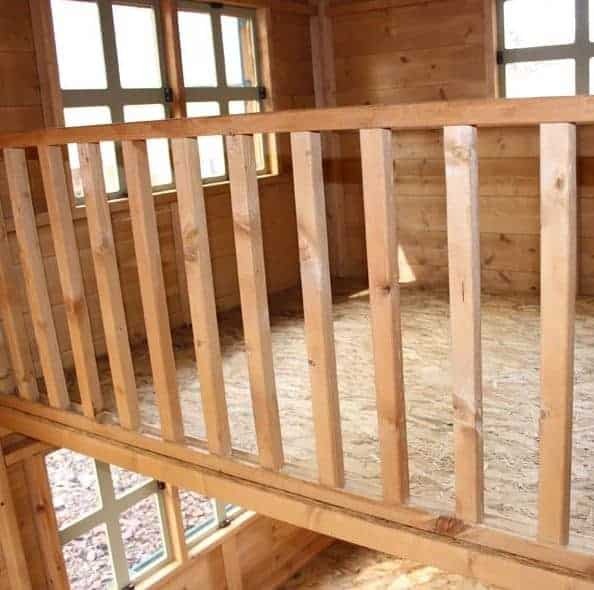 This offers the children a whole lot of room to play as there is the very large lower level and then with the help of a fun and safe ladder they can climb up to the loft which is made safe thanks to some railings. This is a very attractive looking playhouse and a huge part of that is the vast amount of windows that it has. Three of the four sides of this structure have multiple windows, with two of them even having these adorable little window boxes. This has been made very well, and the kids will have many years of fun in here. Also it has passed child safety tests and with features such as the railing on the loft, the gap around the door and the shatterproof windows, you will always feel safe when your kids are playing in here. 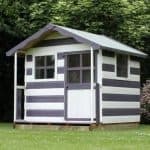 As well as offering a lot of safety, this playhouse is also very strong thanks to being made with some truly impressive materials such as a solid frame, tongue and groove shiplap cladding and strong flooring. The apex roof has a very impressive look and it will also make sure the rain never gets into the playhouse. 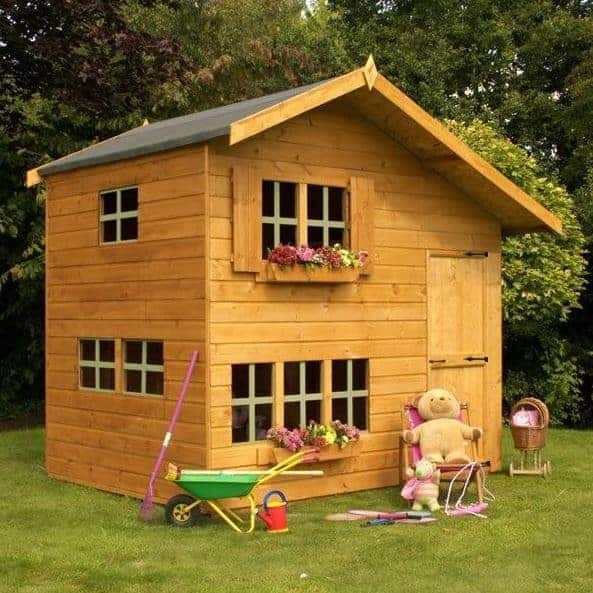 The 8 x 6 Waltons Honeypot Bramble Wooden Playhouse is one of the most incredible looking playhouse we have ever seen. This has a high quality look to it and the kids are going to love it so much that they will want to actually move in here. As you can see from the pictures this is one very attractive looking playhouse – it has a log cabin or even a woodland resort type of look to it. This is a multi level playhouse so as well as the, 7 feet 9 inches of width and 5 feet 8 inches of depth that the ground level has, once they climb up the ladders which look amazing and are also child safe, they will have another area that they can make use of. This upper level has a lovely railing so that they cannot jump or fall off. From the floor to the peak the height of this playhouse is, 7 feet 11 inches so to a kid when they stand inside here and they look up it will feel huge. The apex roof looks incredible it is slanted more on one side and it really does give it a striking and impressive look. The roof has a bit of a veranda or if you prefer overhang which is a very nice touch. High quality sand felt is used to cover, 8 mm thick solid sheet boards. This is one strong roof that is even made even more impressive thanks to its gorgons design. We are sure that the smooth look of the walls caught your eye and the we are very pleased to tell you that it is just as strong as it is appealing to look at. This is tongue and groove shiplap cladding and it is a solid, 12 mm thick. This cladding is something Waltons have used many, many times so they have perfected it in that it is pretty much impossible for water to get through it. This is a larger sized playhouse and we will admit that we were a little concerned that Waltons may use a thinner frame than the usual, 28 mm x 28 mm frame we have seen them use time and time again, but thankfully, Waltons are not a company who cuts corners so we can tell you that they have used their standard, strong 28 mm x 28 mm frame with its double framed corners that we love. This makes it a very robust structure that can take quite a bit of punishment from the kids. 10 mm thick solid sheet boarding is what makes up the floor and we can tell you that this is very strong and no matter what kinds of fun and games the kids are up to this floor is up to the task of dealing with it. The vast floor space means that they have lots of space for their toys, table, chair and anything else they may want. 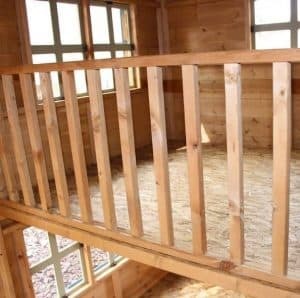 This playhouse benefits from having an upper level with is made from the same type of flooring so they have even more floor space to make use of. With this being such a great looking playhouse, you are of course going to want to keep it looking its very best for many years. Well the timber is only given a very basic, short term coating of protection before it is sent your way. However, Waltons do give you a free 5 litre tub of golden brown wood treatment. This will need to be applied shortly after construction and also once a year. To be honest this apart from picking up the food the kids leave inside here, this is the only maintenance you have to do. 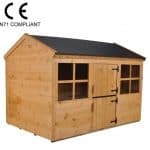 Waltons give you a ten year anti rot guarantee with this playhouse. While this is a very generous guarantee, you must be aware that it is only valid as long as you have treated the timber. At 4 feet 7.5 inches high and 2 feet wide this is one of the largest doors we have seen on a child’s playhouse. While the dimensions of the door make it very easy for them to get things in and out. The door also has been made so that it is safe for children. For a start, Waltons have put a 12 mm gap around the door ensuring the purpose of this is to prevent the kids for getting their fingers trapped in the door. Also rather than use just two hinges, they have used three which will keep the door from sagging. We love the look of the door, we really do, but we have seen some other doors on Waltons playhouses that have a little window on them and we think that would have looked very good on here. 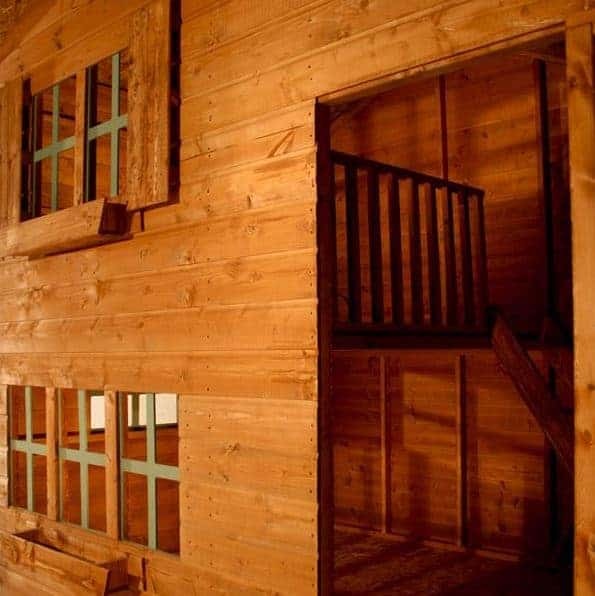 We are struggling to think of a playhouse that has as many windows as this one does. All of the windows on here are made with 2 mm thick shatterproof styrene which is a much safer alternative to glass as it cannot shatter into a million little pieces. On the front we have the most impressive windows. On the upper lever there is a large double window that has a set of decorative shutters and a lovely little window box. Below this we have three windows that are all placed next to each other again there is a window box underneath these. The side of the playhouse that is higher has three more windows with one being at the upper level and two on the lower. Lastly on the lower side of the playhouse there is another two windows. As you can see that is a whole lot of windows so there is going to be plenty of natural light getting in here. Despite not coming with any kind of lock the 8 x 6 Waltons Honeypot Bramble Wooden Playhouse is one very secure and sturdy structure. We would suggest that you do not worry about the lack of lock as hardly any playhouses come with one as it can be tricky for a child to deal with a lock. Just make sure the kids do not leave expensive things inside here. 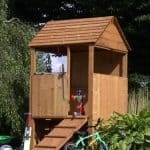 With the incredible amount of windows that are on this playhouse it really is not offering much in the way of privacy. Most kids we are sure will not care, but if they do then you can always let them pick out a little bit of fabric to cover a couple of them up. One way to customise this playhouse a little bit would be with some plants in those window boxes. Also if you are pretty skilled with a paint brush, you could give this a colourful coating of paint. Apart from this, Waltons do not let you make any changes to the design of the playhouse. 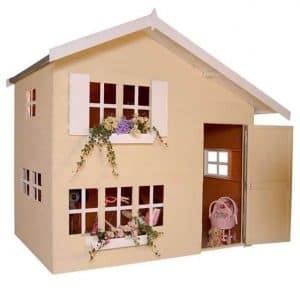 Waltons are offering a few extras and upgrades with this playhouse which to be honest none of them are really essential, but have a look and see if any of the interest you anyway. To start with, for £67.95 you can upgrade the sand felt on the roof to superior duty felt. This can be selected in either charcoal or olive green. 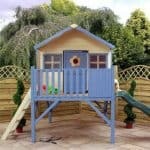 There are two options of adding a base to this playhouse, first is their portabase which will cost £89.95 which to be honest is a very fair price in our opinion. Also they have a very strong, pro shed base that can be added for £129.99. The last thing we want to tell you about is their installation service which is a little expensive for our tastes at £224.99. 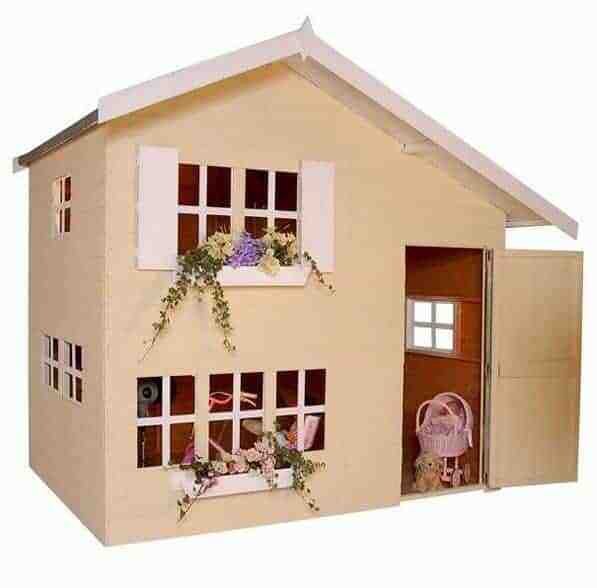 This is the kind of playhouse that when you just look at the pictures, you know it is high quality. Waltons really do deserve a pat on the back for the great job they have done here. Inside the playhouse even with a little bit of rough play, we see this lasting for a lot of years. The outside will also last a long time as long as you remember to give the timber a fresh coating of wood treatment once a year. This is one of the larger playhouse that Waltons offer. It is not just the floor space, but that upper level as well which make this such a spacious place for the kids to play. Any playhouse or even shed that is this high is going to be a little tricky, but by following the instructions and having someone to help you, you will get through it. Just be sure to know that this can take up to 5 hours to install. 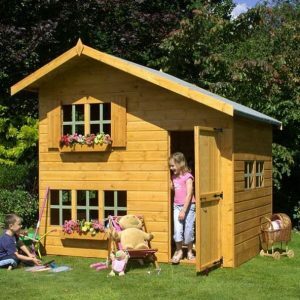 While not the cheapest playhouse from Waltons, we feel that the design, materials and space it offers makes this something that is very good value for money. Final Thoughts: The 8 x 6 Waltons Honeypot Bramble Wooden Playhouse is one of the most gorgeous looking playhouses we have ever seen. The look of this is just jaw dropping and we are sure that the kid will go wild when they first see it. We love how as it is so high, not only does it have a loft, but the loft also has a fair bit of space for them to use as well. We can see your kids easily spending hours and hours inside here and never wanting to come out. 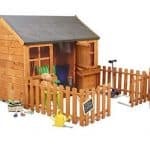 While Waltons do offer cheaper playhouses, at £579.95 we still think that this one here is very fairly priced and is well worth the extra few weeks of saving up for. If you want your kids to have a playhouse that has the awe factor then this is one that is certainly going to make everyone who sees it say wow.